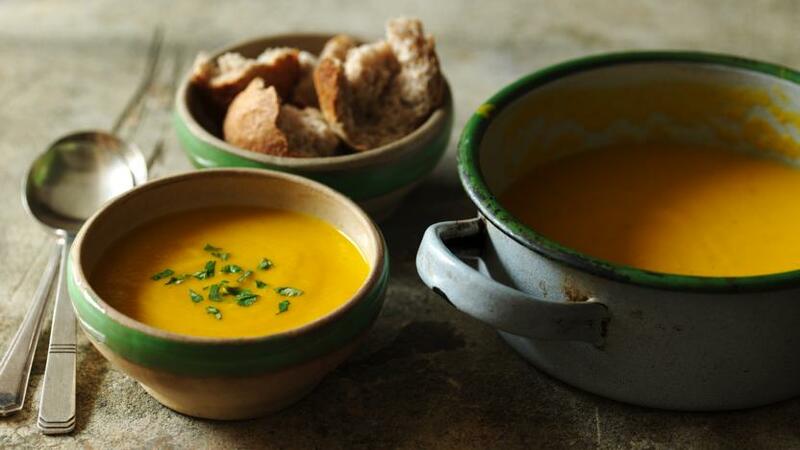 This lightly spiced carrot soup is so simple to make, yet it makes a delicious supper on a cold winter's evening. Melt the butter in a saucepan and sweat the onion, garlic and carrots, with a pinch of salt, for 5-6 minutes, or until softened. Meanwhile toast the cumin seeds in a dry frying pan until fragrant. Add the toasted cumin seeds and Madras curry powder to the vegetables and cook a further 2-3 minutes. Add the stock, bouquet garni and 500ml/18fl oz water and bring to the boil. Reduce to a simmer and cook for 30 minutes. Remove the bouquet garni, then blend the soup in a blender until smooth. Pass through a sieve into a clean saucepan and season to taste with salt and freshly ground black pepper. To serve, ladle the soup in serving bowls and sprinkle with chopped fresh coriander. To make it vegan, fry the onions in olive oil and use vegetable stock. Check the stock is gluten-free if required.